Hit the Trail: 50 Hikes Is Now Available! 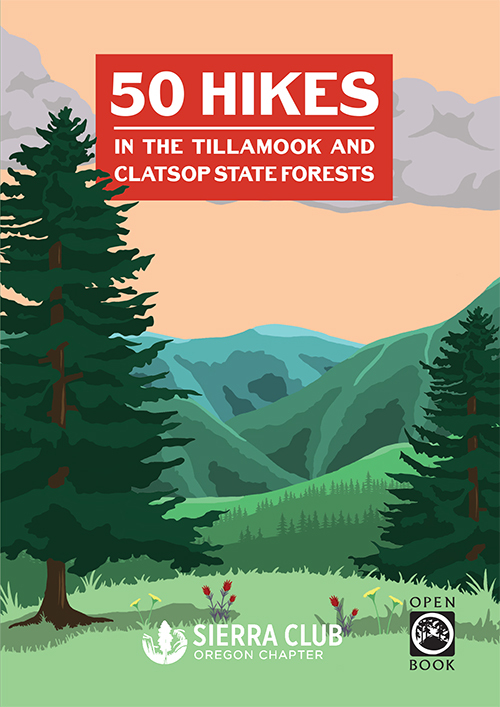 50 Hikes in the Tillamook and Clatsop State Forests was published on March 1, 2018, and hundreds of hikers have already snagged a copy and hit the trails. On March 10, The Ranger Station hosted a well-attended launch event, at which guest speakers Tara Brown of the Wild Salmon Center and Greg Jacob of the Sierra Club shared important information about our state forests and how to turn hiking into advocacy. Now we’re trying to get the word out about the book as much as possible, though the book seems to sell itself. Still, we are broadening our audience with continued news coverage, social media posts, and book events. In April, Tillamook Bay Community College invited me and Greg Jacob of the Sierra Club to speak about the book and the forests. In the coming weeks, you can learn more about 50 Hikes in an Astoria radio spot, a May 17 meeting of the Oregon Sierra Club, and through many other channels. This spring and summer is this book’s chance to shine. We urge you to look out for a 50 Hikes photo contest over social media; the best photo from the Tillamook or Clatsop State Forest will garner a special grand prize to facilitate further adventures into the wilderness. This book is special to us because it’s more than just another book. It introduces Northwesterners to beautiful yet relatively unexplored areas in our backyard. It’s about showing people that these forests, which have been famously devastated by fire and logging, are now viable playgrounds for horseback riders, cyclists, hikers, and campers. It’s about encouraging people to become advocates for these forests and the wildlife within so that future generations can enjoy the same trails. 50 Hikes was a pleasure to work on, and we hope outdoor enthusiasts of all types will continue to discover it. But now that this title has slipped into the backlist, we have set our sights on a new project, and we think readers will be very pleased with what we’re brewing. Stay tuned!